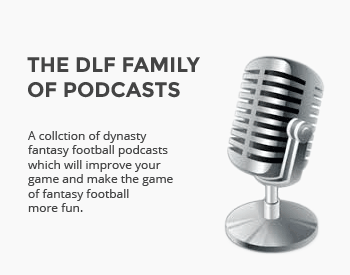 In addition to our vast library of articles, DLF offers a host of other tools, links, and other resources to help help you improve your game and become the best dynasty fantasy footballer in your league. We also feature a carefully curated list of links to others sites, podcasts and third party tools we feel are particularly valuable. The oldest, largest and most active dynasty community on the planet. This is the place where it all started. It’s never too late to join in the discussion and connect with tons of smart, passionate dynasty fans. A variety of podcasts for your listening enlightenment. Every week you’re getting some extra insight delivered right to your inbox. A totally free little widget for your desktop which discreetly updates you with the latest fantasy and player news. The DLF team put thier best into the rankings data and commentary. Constantly updated & totally interactive, no other site boasts the in-depth functionality of the DLF rankings. Industry standard ADP data for determining dynasty and devy player value. Graph and compare historical ADP value for one or more players. 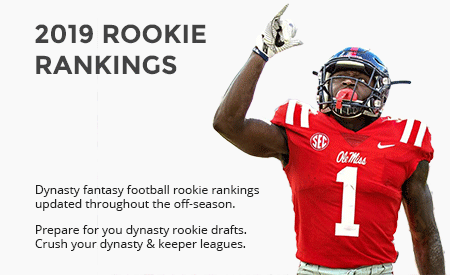 Find the actual draft value of rookies in real world rookie dynasty drafts on MyFantasyLeague. Please note this data only updates when actual rookie drafts are occurring, so the data will remain stagnant through much of the year. But it will be active around the time of the year when rookie drafts are happening which is what really matters, right? Breaking player news updates with a dynasty perspective. View and search for dynasty players. Pages include player performance stats, rankings & ADP data, links to articles, contract info, metrics and more. 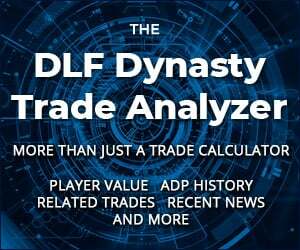 Search for recent completed, real world trades across thousands of dynasty leagues on MyFantasyLeague. All of our articles in one convenient location. Good luck ever leaving the bathroom now. Search for content by topic, author and date range. Google style search for content in all of our articles. Do you have a question? Need help, trade advice, can’t figure out how to do something on the site? Start here. The entire DLF team crammed into one tiny page. It’s like a TARDIS for football nerds. What makes us different than many other sites? Hint – it’s not our love for the oxford comma. Comments from other readers and subscribers about the DLF experience. Seriously, we’re putting it all out there every day of the year to help you win your dynasty leagues. Help us help you! You can play in some daily fantasy games and get your DLF premium membership for free. It’s like a win, win, win-win-win! There are other good sites out there. We’ll help you find them. Many great podcasts, one place to play them all. Latest NFL news from various trusted sources. Latest fantasy analysis from other websites who know also their stuff. These are some of the sites and services that help power DLF.